It’s no secret that mobile phone use has been on the rise the past few years. Everywhere you look, you see people of all ages browsing the web through their smartphones. That’s why it’s important that you capitalize on this upward trend and make your small business mobile-friendly. If you don’t, you’re missing out on a massive part of your market. Why would you want to limit your business? According to Google, 9/10 consumers leave a website if it isn’t mobile-friendly. So, the first step involves making your website design responsive. This means that the design and development of your site responds to whatever device your customer is on. If you know your website isn’t responsive, you now have a starting point to making your business mobile-friendly. 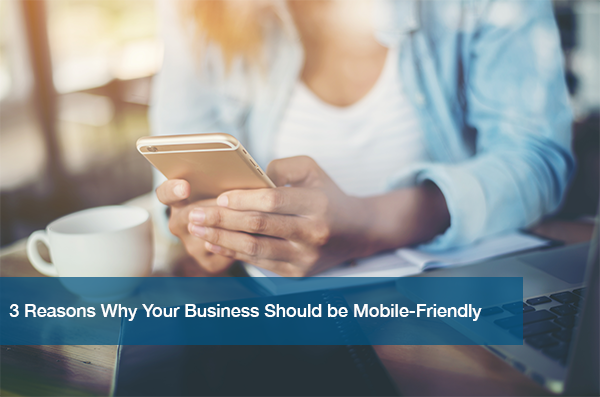 There’s many more ways to make your business mobile-friendly. But, if you need more convincing, here’s three reasons you should take action in the first place. Trinity Digital Marketing stated that the number of worldwide smartphone users is at over 1.2 billion. Also, more than half of all consumers use their smartphones as their main research tool when buying locally. That’s insane! These numbers alone should motivate you to become more mobile-friendly. It shouldn’t be an intimidating task, because it’s easier than ever to make it happen! The world is moving faster and faster, and your business needs to keep up. Being mobile-friendly can help. It’s important to invest in SEO rankings so your company is even easier to find. That way, when consumers are searching for your services on their phone, your business is one of the first to appear. It is also important that your site’s load speed is fast. Otherwise, consumers will get impatient and move on. Through a responsive website, enhanced SEO, and social media presence, your business can be easily found by consumers on their smartphones. Think of all the potential that can be reached just by becoming more mobile-friendly. By delivering a quality mobile experience, you get an extra edge on your competition. ITC can help make your small business mobile-friendly. We’ve worked with many businesses to make sure their websites are responsive through our WordPress Management services. We can sit down with you to go over how your business can be more mobile-friendly and find the perfect solution for you. If your small business needs website help, schedule your free IT needs assessment today.